18 Jul Lamb prices move further off the chart. Lamb and sheep markets have hit some solid resistance at the 730¢ and 520¢ mark respectively. 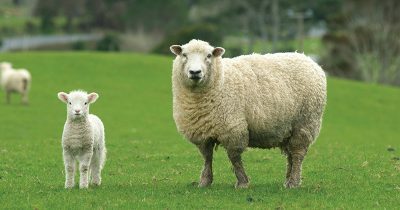 There are plenty of reports of processors cutting shifts and slowing production rather than competing harder for lambs. 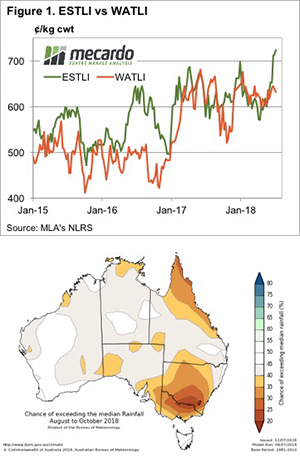 The latest three month forecast doesn’t suggest the supply of finished stock is going increase soon. You may have noticed that we have had to change the Y-axis on our Eastern States Trade Lamb Indicator (ESTLI) charts. In fact, when we rolled into the new financial year, the ESTLI was literally off the chart. The top of the ESTLI charts are now 750¢, but the rally has slowed and it might not get there in short term. However heavy lambs are not far off, hitting 743¢ this week. We’ve seen a new record high for the ESTLI, this week gaining 11¢ to reach 724¢/kg cwt (Figure 1). The WA Trade Lamb Indicator is ‘languishing’ at what used to be a very good price of 632¢/kg cwt. The cheapest lambs in Australia are restocker lambs in WA, with the indicator at 514¢/kg cwt. In SA the restocker lamb Indicator was at 740¢, which makes the trip across the Nullabor viable. We’re not sure where the demand in SA is coming from, but suggest the indicator comes from a small number of lambs. We heard an anecdote today about store sucker lambs coming from areas north of Adelaide with 1000 on a B-double. This is a lot of light lambs. We have been on about the increased supply of store lambs this week and this sounds like the beginnings. The weather forecast tells us the finished lamb shortage might last a while. There is a 65-80% chance that rainfall will be lower than the median across almost all of Victoria and NSW. There are some key lamb growing areas which are currently going ok, but most with new season lambs hitting the ground now are unlikely to be able to soak up extra supply from the north. It might be time to start thinking about how to finish lambs this year, even if they haven’t been born yet.